Echo cornet in silver plated brass, signed "EXCELSIOR / CLASS / RIVIERE & HAWKES / 28 LEICESTER SQUARE / LONDON 4351" also with applied plaque, made c.1880. Bell diameter 12.5cm. In very good original condition. Mouthpiece signed "H.KEAT & SONS LONDON"
Bb key bugle in copper with brass mounts and eight brass keys (with scallop shell key cups), unsigned, made c.1835, probably in Germany. Bell diameter 14.9cm. Length (excluding crook, tuning bit and mouthpiece)43.0cm. In good original condition, needs a repad. Tuning bit and mouthpiece not original. Brass cornet with three Stoelzel valves (the early type with the exterior locators), signed "DUBOIS / & / PROJEAN / LYON" made c.1850. Bell diameter 12.9cm. In original wooden case, lined in chamois leather, with mouthpiece, two tuning bits (the shorter stamped SIB, the longer unsigned), six crooks (LAB / SOL / FA / MI / MIB / RE) and music lyre. In good condition, recently overhauled, the longer of the tuning bits is probably not original as it is unsigned but it fits perfectly and has obviously been used with this cornet. One of the valve touches is not original. Both the exterior and lining of the case show some wear and a little damage. Trombone in brass with three Stoelzel valves, signed �J (harp) G / J.GRANJON / Bt de S�bastopol 105 / Rue R�amur 48 / PARIS / BREVETE� made c.1870. Length 74.0cm. Trombones with Stoelzel valves are rare. 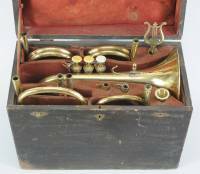 Cornet in brass with one Perinet and two Stoelzel valves, signed "PIATET / A LYON" made c.1840. Bell diameter 12.0cm. With one crook, stamped "LAB" and mouthpiece by "A.BRULE / LYON"
In good condition with a couple of small dents to the bell and another couple to the tubing. The valve finger touches are not a matched set. Needs an overhaul to be playable. The valves are all of an early type with external locators. A very rare model with a mix of Stoelzel and Perinet valves. Euphonium in silver plated brass with compensating valves, signed "Imperial Model / SOLBRON / (REGISTERED) / CLASS A / TRADE MARK / BOOSEY (in trumpet with banner) / COMPENSATING PISTONS / BOOSEY & CO LTD / MAKERS LONDON / 131104 / British Throughout" Floral embellishment around inscription, made c.1928. Height 64.5cm. Bell diameter 25.4cm. The fourth valve has a lever to hold it down. In original hard leather case. "Solbron" refers to a special material for the pistons, "Class A" is the best quality. In good playing condition, plating worn in parts, few minor dents on bottom bow. Illustration and details of similar euphonium, plus information on Solbron and compensating valves from "Illustrated Catalogue of Military & Orchestral Band Instruments Manufactured Throughout by Boosey & Co London" dated 1923. Cornet in brass with three compensating valves, signed "Halari / DIPLOME D'HONNEUR / F.SUDRE / SEURL FOURNR DE LA MARINE / FACTEUR DU CONSERVATOIRE / ET DE L'ARMEE / 6 et 8 rue Poitevins / A PARIS" also signed on the first valve "AJUSTEUR / DANIEL / BREVETE" A variation on E.Daniel's 1881 Patent. Generally in good working condition, all the valves work, all the slides slide, two patches on the body, needs a clean. French Patent No.140868 taken out be E.Daniel in 1881. 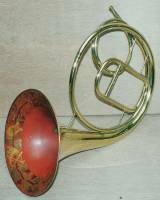 Natural horn in brass with red and gold decoration inside the bell, signed "L.Embach & Co Amsterdam" made c.1830. Bell diameter 27.0cm. With one crook. In very good original condition, the painting is a little worn but generally very good. The crook has several patches.